At about 10am local time we are ready to hit the road again – HWY 15 North. Soon after St. George, UT, we are up at about 5,000 to 6,000 feet elevation – meanwhile, we drive through wide valleys, one after the other and one more beautiful than the other, some farming, lots of pastures with horses and cattle, and just wide grassland from one mountain range to the other, here and there some water in form of a pond or a creek. Fall is showing here already as most trees are having colored leaves and the grass is dry and looks golden in the sun. We also get the impression that the economy here is still in better shape than in New Mexico and Arizona. The towns we pass look much better and livelier than what we encountered on our trip in August. We hardly ever see any buildings that are boarded up or marked for sale – and the reason why, we find on the internet: in 2010 St. George was the second fastest growing metropolitan area in the US. The county (Washington County) experiences the fifth highest job-growth rate in the United States and is known for warm winter weather, snowbirds, and beautiful red rock scenery. 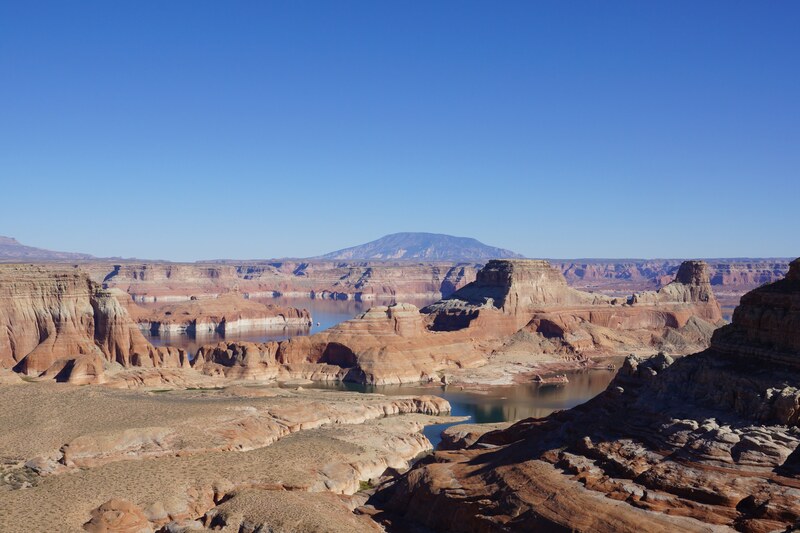 It has been known as Utah’s Dixie since pioneers settled here in the 1850’s. The 250 miles from St. George to Provo are just breathtaking, then from Provo until after Salt Lake City it is rather tiring, with lots of construction and dense traffic. Then we drive along the Salt Lake and on to Idaho. At around 5:30 pm we are in Idaho Falls where we intended to stay for the night, but since Marco still feels ok to drive we decide to go all the way to West Yellowstone. In the evening light we drive through the golden aspen trees and pines that are leading our way to West Yellowstone. We see the mountains from Teton National Park from far and then soon after the mountains in Yellowstone – it’s a feast for the eyes – we wished we could share these impressions with our families! It’s been a long 622 miles we coped today but through fascinating and gorgeous American country side and we once again experienced first hand how big and amazing this country is! We arrive in West Yellowstone and are greeted warmly by Dan and Brenna at the Moose Creek Inn. We are lucky to get a room for 3 nights (they are still very busy) and then head to the local Pizzeria for dinner.